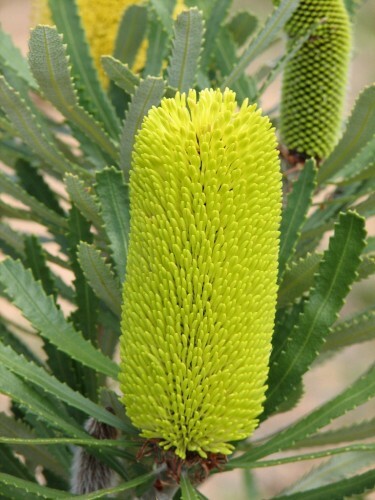 Todays’s jobs have been outside and included planting out a box of 24 Banksia plants in the front entrance area of our place. The spot was chosen for several reasons. Firstly these are spectacular plants when in flower so I wanted them to be where we could see them from the house. People driving or walking past would also get pleasure from the sight of the flowers. The area is well drained, deep, sandy loam, although inclined to be water repellant. Some of the plants will be quite large and will form a screen and windbreak which I want in that location. Species planted were Banksia caleyi, praemorsa, marginata, sphaerocarpa, ashbyi, dryandroides, lemanniana, oblongifolia, repens, hookerana, candolleana. How successful they are remains to seen. The high pH of the soil may be a problem. I want to grow them without any external interference, other than water, if I can. I soaked the plants in a bucket of water containing a soil wettting agent. Tomorrow I will add some granular soil wetter to the planting spot just under where the dripper water will hit the ground.